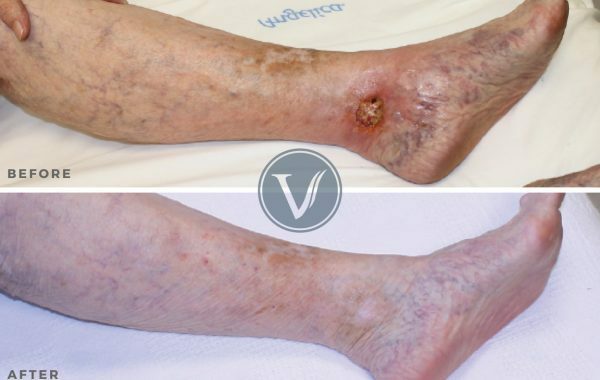 This 48-year-old female came to The Vein Institute seeking relief from pain, swelling and worsening varicose veins on both legs. She had daily pain and swelling in her legs, which was worse on the right side. She also reported an aching, throbbing type pain. Standing for long periods and sitting both made her symptoms worse, increasing throughout the day. There was some improvement with leg elevation and compression. She also had a blood clot in her right lower leg with her first pregnancy and was on an injectable heparin for the last 3 months of her pregnancy. She had previously tried sclerotherapy in the past with no success. Dr. Gardner began a treatment regimen that included endovenous laser (heat energy) ablation, microphlebectomy, and sclerotherapy. The reported a decrease in pain, and aching, and was thrilled with how much better her legs looked.